Nobel Prize winner Richard Feynman is remembered not only for fathering quantum electrodynamics, but also for his mischievous streak — especially throughout his work on the Manhattan Project building the first atom bomb. But while his roguish charm won over classrooms and the public, Feynman was subjected to years of espionage and scrutiny as the Federal Bureau of Investigation trailed him and his associates, intent on rooting out communist sympathies from the man who helped make America the world’s first nuclear power. 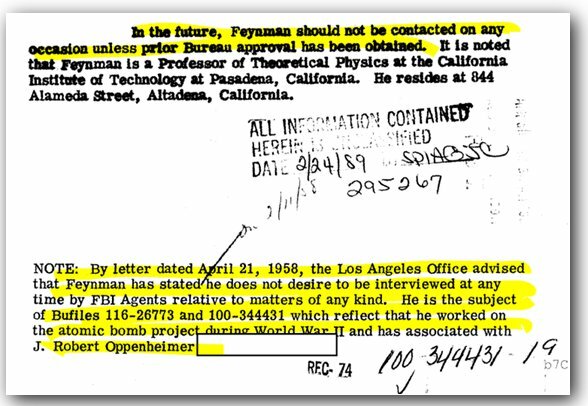 For the first time, FBI records of Feynman which detail this tension—as well as hundreds of pages of interviews with his colleagues, friends and acquaintances—have been released online to the public by MuckRock. After successfully helping development of the atomic bomb at Los Alamos, Feynman largely left government service for a career in academia, first at Cornell and later Caltech (he would continue to occasionally consult for the government, such as on the Challenger explosion task force). In the early 1950s, the American intelligence community was on high alert after a number of Manhattan Project participants were outed as Soviet spies, including Klaus Fuchs and Allan Nunn May. The FBI began keeping a watchful eye on Feynman’s work even while considered him for work as a potential intelligence asset. In interview after interview with the FBI, Feynman’s friends and colleagues cited him as brilliant, loyal and an excellent fit for government service. But Feynman’s past and present associations dogged him, particularly as questions swirled around the loyalty of his friend and colleague Robert Oppenheimer because of his own left-wing ties. The concerns about communist sympathies were further inflamed by public statements Feynman made dismissing religion (the FBI files include several newspaper clippings of such talks) as well as his openly liberal politics. 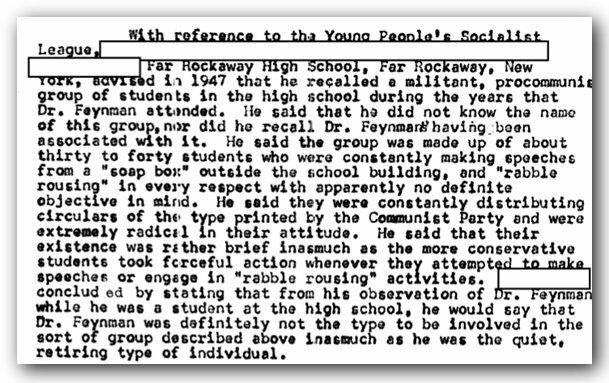 Even his high school extracurricular activities came back to haunt his FBI files: Feynman’s brief association with the “Young People’s Socialist League” makes numerous appearances in his files. The group was described by one unnamed individual as a militant group of students dedicated to “rabble rousing in every respect”. The association was apparently short lived and based more on Feynman’s desire to fit in with his friends than actual political sympathies, and that same unnamed individual could not remember Feynman’s participation in the group’s activities. Feynman would later be quoted by an FBI informant as stating he had little use for those who trusted the Russians. It was while Feynman was at Caltech, in January 1955, that the Soviet Union extended Feynman an invitation to an all-expenses paid trip to a prestigious physics conference in Moscow. The letter would precipitate the FBI’s most lengthy investigative files on Feynman. The FBI found out about the proposed trip while sifting through the trash of Soviet Union Ambassador Georgi Zaroubin’s office. They had recovered a discarded draft of the invitation, setting off the flurry of investigations into Feynman’s possible travel across the Iron Curtain. However, Feynman’s desire to attend was matched with reservation—he thanked the Soviet Ambassador but wrote that he was “unable to give a definite answer,” using an expiring visa as an excuse to delay his response. Despite the FBI’s surreptitious surveillance, Feynman had actually alerted the State Department first thing upon receiving the invitation, hoping to receive guidance and indicating that he would be happy to help serve the United States’ propaganda interests abroad, or to simply decline the invitation outright. The letter was immediately forwarded to J. Edgar Hoover, the then-director of the FBI. Neither agency actually responded to his letter, however, and instead FBI officers continued investigating whether Feynman was making plans to go abroad. Appearing incapable of making an independent decision to Feynman’s travels, the State Department waited two months to hear back from the FBI, which provided a brief summary of Feynman’s history and merely stated that it “is not to be construed as a clearance or a nonclearance of the individual involved.” The declassified documents portray the FBI’s tacit monitoring and restraint in taking any direct actions against Richard Feynman. Immediately following the FBI’s reply, Walter Stoessel of the State Department finally notified Feynman, “we urge you to decline the invitation,” but made no indication that he will be prevented from attending. I think we could gain something by going to the meeting, but … there is an unwarranted risk, and furthermore, I don’t think the American people would like the idea of one of their scientists, especially one who has worked on the atomic bomb, visiting Russia. I guess I could have gone if I wanted to, the government didn’t indicate it would do anything to stop me. It was as if it (the government) expected me to make the decisions. 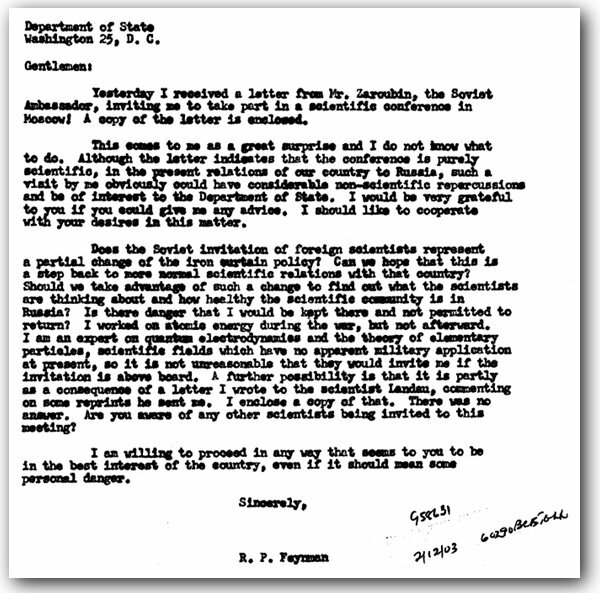 After the drama surrounding the Soviet Invitation, the FBI’s involvement with Feynman was reduced until 1958, when the White House requested a routine investigation into his background for consideration for the position of Scientific Advisor to President Eisenhower. Perhaps the investigation was the final straw for the man who had always eschewed red tape and bureaucratic incompetence: Feynman asked to be put on the FBI’s “Do Not Contact” list. A review of the Bureau’s assassination investigation uncovered the extent of an illegal counterintelligence program.